Saturday at home was well spent, working from home which of course got us craving a nice warm meal. His solution? Lamb Shanks and the Instantpot! I was slightly hesitant, wondering if it would turn out great given that we always used the oven- but to my surprise, it was quick, easy and took all of 40 minutes- the best part was the flavor that seeped into the meat! 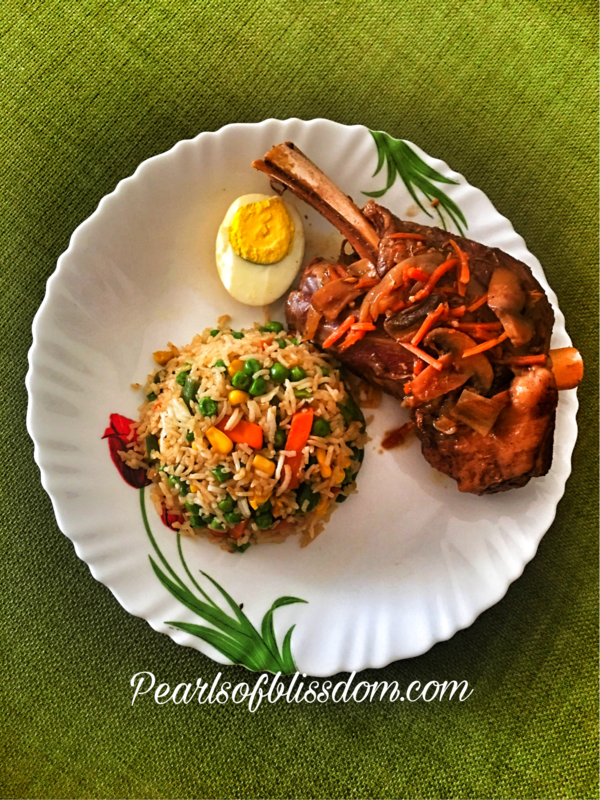 Lamb with a side of home made fried rice!! Recipe: ( Note it can also be made in a big pressure cooker). Sliced mushrooms ( Can add veggies of your choice). 0.25 cup water ( to bring the IP to pressure). – Combine pepper, garlic, paprika, oregano, salt, cumin seeds, cinnamon sticks, and oil. Mix well and coat meal. Keep aside. – Using sauté setting, heat Instant Pot. Once hot add 2 Tbsp. of olive oil and thoroughly brown lamb on all sides – making sure to render all the fat. About halfway through, add the contents from marinade to the pot. – Once lamb is browned, add the veggies and sauté until the onions are done. – Add red wine to deglaze the pot – making sure to scrape all the bits stuck to the bottom. Simmer to reduce by half – about 10 minutes. – Add stock and then c lose lid and switch to manual setting for 30 minutes. Make sure that the pot is sealed. – Once cook time is complete – Let pressure naturally release for about 10 minutes, then quick release if desired. Once the pot is opened, sauté it for a bit to thicken the sauce – you can add corn starch if desired- we didn’t. I added hard boiled eggs here to retain the flavor of the sauce. Serve over your choice of starch (rice or mashed potatoes). We made a quick fried rice with mixed veggies from leftover rice. What a fabulous idea for a quick succulent, mouthwatering meal- how could I ever doubt my Instantpot- it always delivers!! !